Florida – also called the Sunshine State – attracts with over 1,930 km the finest sandy beaches and therefore offers the tourists numerous bathing opportunities and water sports. A beach holiday in Florida can be an unforgettable experience for the whole family. But before you book your flight, you need to fill the United States ESTA application form. There are also many spare time activities in addition to relaxing on the beach – you can find in Florida alone over 1,250 golf courses on which the Florida travellers can improve their handicaps. The Sunshine State has a total of 19 civil airports – including 5 international airports – This makes the trip to the beach paradise very easy. Whether on the beach of Miami Beach, Fort Lauderdale or in the exclusive Naples and Palm Beach: The beaches are never crowded! Ideal for the entire family, and anybody who wants to relax, take extensive beach walks or play with beach toys. Officially there are also 4 seasons in Florida but this US state is always an ideal destination for a beach holiday, because even in the winter is the average temperature is approx. 18°C – perfect to relax on the beaches of Florida. If you want to escape the freezing temperatures in other parts of the world and you need an ESTA visa to enter the USA then hurry and fill an ESTA application. ESTA is an automated system that determines the eligibility of visitors to travel to the United States under the USA Visa Waiver Program (VWP). The USA ESTA application gathers biographic information and replies to eligibility questions. The USA ESTA application form can be found on the web an online application can easily be submitted. The Lummus Park in South Beach is part of the Deco District and has been the backdrop for many television or film scenes. Perhaps not the most beautiful beach, if you judge the quality of the sand, the cleanliness of the water and the amount of visitors. But definitely the coolest Beach in Florida and the best urban beach in America. It is the ideal place to meet people and to be seen, flirt, play volleyball and surf. 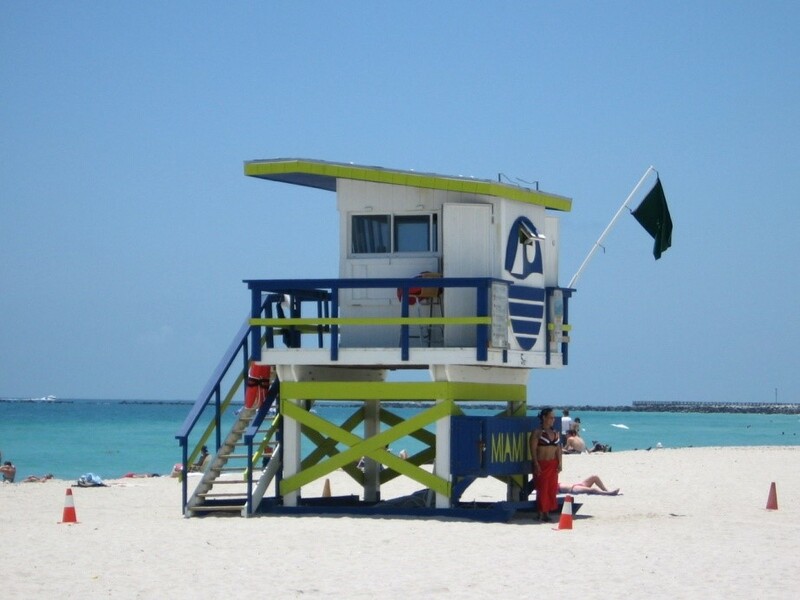 The pastel coloured Baywatch Towers are a special attraction, so bring your camera. The beach of the St. Joseph peninsula lies in the north-east of the gulf across the bay from Port St. Joe and is well worth a visit! It is a spacious and untroubled idyll. The small peninsula is protected by dunes and fine, wide, white strip of sand stretches for more than nine miles long. St Joseph Peninsula Beach was crowned in 2002 as the best beach in America, because it is ideal for long walks. This beautiful beach is located on an island group outside the city of St. Petersburg. St. Petersburg is also known as “The Sunshine City”, because it holds the world record for the most consecutive days of sunshine. This beach is very poplar, because it has such crystal clear water, the water is also very shallow and ideal for families with small children. The pure white sand is also very fine. Grayton Beach has a beautiful and untouched beach on the otherwise strongly developed golf coast. The small, historic village on the Florida Panhandle lies halfway between Destin and Panama City. The beach is about 2 miles long and is located in a State Park with the same name. This stunning beach is unusually wide with almost white sand and clear blue green water. The next holiday locations can be seen far in the distance to left and right of the beach. Anyone who wants to stay can camp or rent a simple hut. The way to the beach leads through a charming barren landscape with brackish water lakes, salt marshes and low dunes. If you are looking for a natural beach with clean sand, lots of shells and minimal visitors, than this beach is the right place for you. You can cross the dunes to the beach on long, high-altitude wooden bridges. The long and lonely beach is a suitable place for picnics. One thing makes this particularly special: Nowhere else can you so easily find fossil shark teeth in the sand. The ocean current in this region washes the teeth onto the beach and they can easily be picked up. This beach is one of the best places in the world to collect seashells! It is definitely worth a visit and has a fine white sand and flat, glass clear, blue shimmering water with mild waves. A footbridge crossing leads to the beach, which is located behind vast sand dunes and marshes. You can find toilets and changing rooms at the car park. The beach at the Bahia Honda State Park stretches for many miles along the Atlantic Ocean; the water is shimmering in a light blue, turquoise or is even sometimes brownish from the sea grass meadows. The seaweed lands often on the white sandy beach. The fish hunting pelicans are a great attraction at this beautiful location. The water is also quite shallow only reaches to chest height, even if you go quite far in. From the second beach, the Calusa Beach, you can look at the old Bahia Honda Bridge; this steel construction is a relic of the Flagler Railway, which is partially accessible. This beach offers fantastic views over the shimmering sea. The meadows of the park at the top of the Key Biscane are visited by countless butterflies, as well as 200 different kinds of birds. The area has been replanted with its original vegetation in 1992 and has become a paradise for indigenous insets and birds. The Dunes can be crossed on fairly narrow wooden walkways. There even is a special pier where fishing is allowed. Daily at 10am and 1pm to the old lighthouse can be visited and it is really worth it! The crossing from Dunedin to paradise Cala Desi Island takes only 20 minutes. The islet in the north of Tampa lies in a state park. There is a small boat harbor, a snack bar, sanitary facilities, picnic shelters and nothing else. In particular there are no cars and only a few tourists, because nobody is allowed to stay longer than four hours. A long wooden walkways leads form the harbour through the dunes to the west side of the island where the guest can find an almost three miles long beach. Of course there are many more beautiful beaches in Florida, and every year one beach is crowned as the best beach of Florida. So start planning your Florida beach holiday today and apply for your ESTA visa.